Group counting is opposite to back-counting. 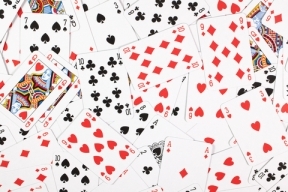 As the name implies, it is a card counting technique where the players all work together to increase their chance of winning. Back-counting is done by a non-player who stands behind the blackjack table and enters the game when it is favorable for him after observing the game and counting. Group counting in blackjack works to the advantage of all the players. In popular culture, the group of gamblers called MIT Blackjack Team was famous for using group counting and was able to earn millions of dollars by using it. A team of gamblers play at different blackjack tables to observe many tables at the same time. At the right time, a player signals when it is best to come to the table and place a large bet. They use group counting card strategy and each player has an individual role to take. The players in a group counting team have many roles to play. Among them are Big Player, Gorilla, Spotter and Back-spotter. The Big Player is tasked to keep the team attached and he makes the most important part of the game - makes a huge bet at the hot table. The Gorilla is not responsible in counting cards. His main job is to move from one table to another and place big bets until it is necessary to come at a particular blackjack table. He takes the roles of a drunken millionaire who is willing to spend too much for blackjack. The Spotter is responsible for counting cards. He is an active player but not in a hurry to place big bets. He is also responsible in signaling to the Gorilla that it’s high time to bet. The Back-spotter finally is the one that observes tables and does signals as well. He does not sit on any table. The book Bringing Down the House is a bestselling book authored by a famous MIT blackjack team member named Ben Mezrich. In this book he described the strategies they used in winning millions playing blackjack. This book paved the way for others to learn about their winning technique. In the hit movie 21, Kevin Spacey and his team of students also used group counting method. This film tells the tale of MIT blackjack team. The lead role is a Math professor who decides to teach his students about this card counting technique and went to Las Vegas to earn winnings. The Last Casino is a Canadian movie based on the book Bringing Down the House. It is considered a remake of 21 because of the same concept. To learn to use group or team counting, several resources can be read. There are books and some articles online. Many gamblers are enticed to be skilled in it because it is very profitable. However, they are required to have trusted teammates. The popularity of group counting led to many groups formed just to be able to do it successfully way back in the 70’s. But famous teams are well-organized teams whose players cooperate together. Group counting is legal and is a method worthy of being learned and tried.